- Reasoning Section of any competitive exam is considered to be the easiest one and helps the candidate to score more. But, the practice is also required to attempt the questions correctly and in time. As, a candidate will get only 30 minutes to solve all 50 questions and more 5 minutes to mark oval in OMR sheet. So, practice with good speed and accuracy is must. 1. Analytical Reasoning by MK Pandey :- This is a book from Arihant's publications, written with latest pattern of analytical reasoning questions asked in Competitive exams like SSC CGL, LDC, FCI, Railways, IBPS etc. If one is studying without coaching and wants to start from the basics, he/she can refer this book. 2. SSC Chapter-wise Reasoning Solved papers 1999 to up till now 4700+ (English) :- This book is like a question bank sorted with chapter-wise so that it's easy to understand and practice the questions on each topic. 4. A Modern Approach to Verbal & Non-Verbal Reasoning :- RS aggarwal are not now based on latest pattern, but still the Verbal and Non-verbal reasoning book has still preferred. The chapter and its rules are good for initial understanding or basics. One can easily understand the basics of different topics from this book. 5. 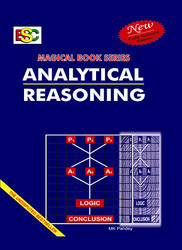 A Modern Approach to Logical Reasoning by RS Aggarwal :- This is another book from RS aggarwal, that contains lots of practice questions on different topics. So, you can practice and buy this book. Also Read: Syllabus of Reasoning for the SSC exams. Daily routine:- There is not much pressure on the students to prepare for this sections. If you are new and start preparation 6 months before the exam, you will required to devote at least 2 hours daily on each topic and also practice previous year questions. When, you cover all the basics and rules of each and every topics, you all need to just practice more questions to brush up concepts. Then, you can spend 1/2-1 hour daily and before 15 days of the exam, must see the rules again and have an overview how questions are asked on each topics. This routine will definitely get you a good score and there is no need to pressurize yourself for this section. Also Read: Strategy to prepare for the Government Exams. Comments "Books to prepare Reasoning for SSC and IBPS exams"